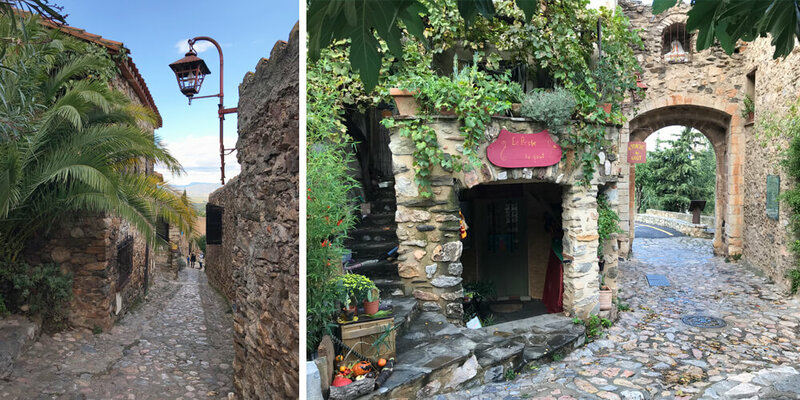 Castelnou is one of the four villages in the Pyrénées-Orientales department in the southern part of France which are officially labelled “Most Beautiful Villages”. My first encounter with this charming village was on a gorgeous bright autumn day. 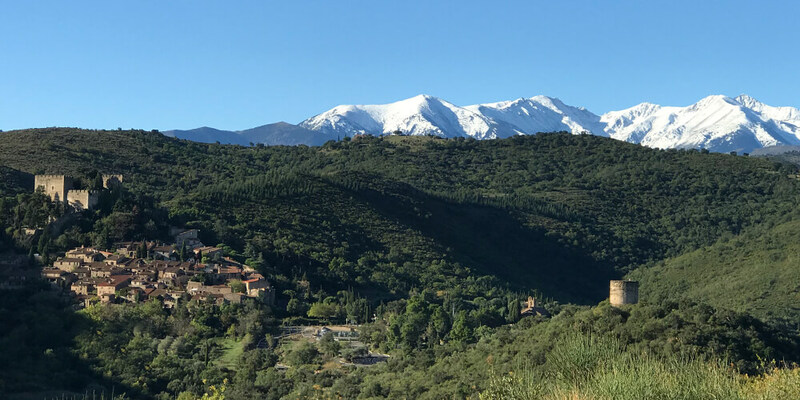 The snowy white peak of the Canigou mountain stood out against the blue sky with Castelnou comfortably nestled in the Les Aspres’ foothills. The meaning of the Catalan word “Castelnou” means “château neuf” in French (or “new castle” in English). 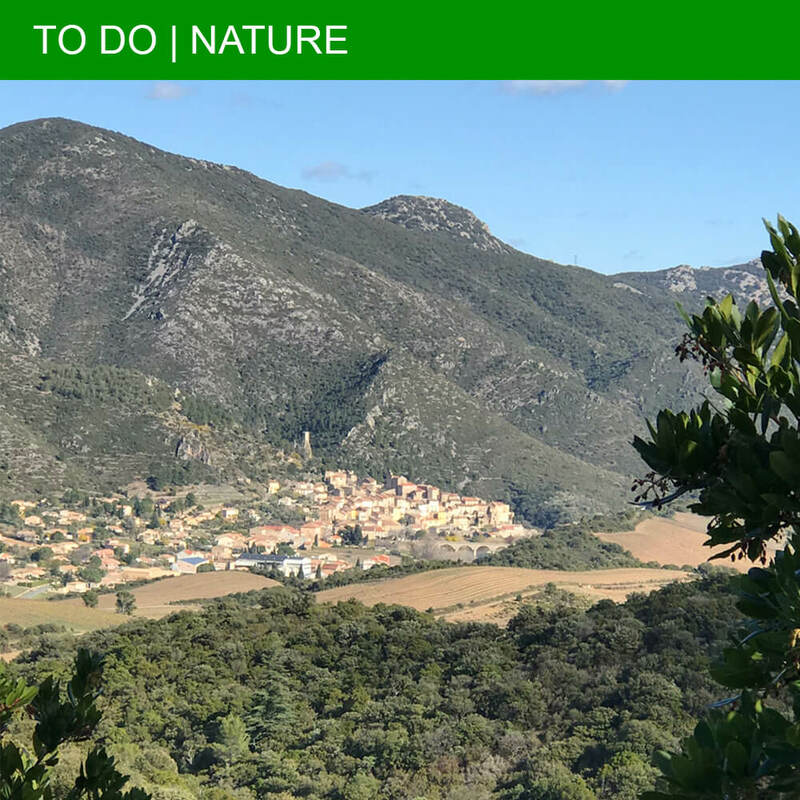 Following the winding D48 road that leads to Castelnou, I had to make a stop at the parking du Col lookout because of its extraordinary panoramic view. So I took my time to gaze over the former capital of the viscountcy of Vallespir and its impressive surroundings. A very promising start! From the lookout, it was only a short drive to the actual village, and shortly afterwards I could park in the designated parking lot, right at the bottom of Castelnou. I entered the village by the north gate, called “Porte de Millars”, which is flanked by two imposing towers. 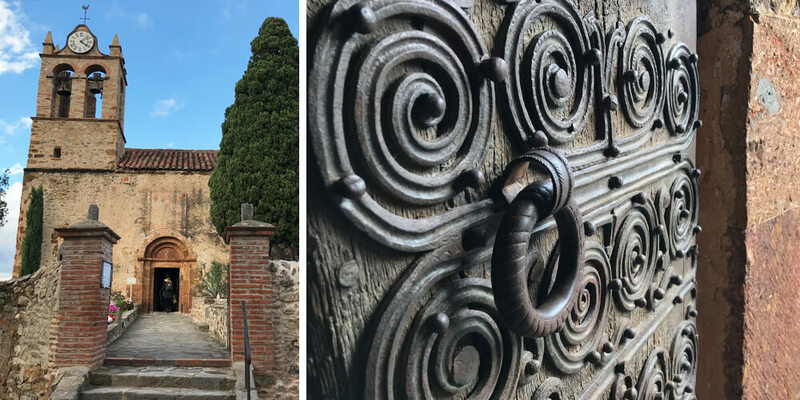 This gate and its towers date from the 14th century and were part of the fortified walls that protected Castelnou from potential enemies. 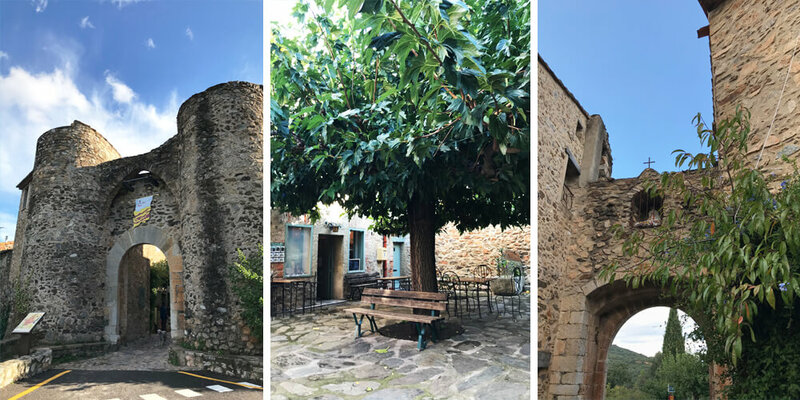 Right after passing through the gate, I saw the most picture perfect little square with an ancient mulberry tree standing proudly in the middle of it. In the square, I bought some local honey at the small café-slash-shop and, walking around, I discovered more shops, mostly selling crafts and art related products. Although the high season is over, a fair amount of shops were still open for business. I loved roaming around the cobblestone streets and admiring the harmony of the architecture with its typical stone houses. 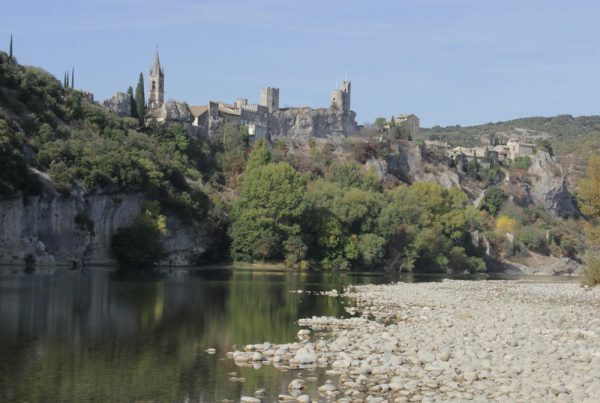 Unfortunately, the Viscount’s castle – dating from the 10th century! – at the top of Castelnou was closed. Instead, I decided to treat myself to a lovely sangria on the scenic terrace of the restaurant/bar L’Hostal. Being so close to the Spanish border has its advantages. On my way back to the car, I walked past the Santa Marie del Mercadel Church. Quite a long name for a church; apparently it is named after a nearby market. These days a traditional producers’ and crafts market takes place every Tuesday during the summer season. They even sell picnic bags full of local goodies which you can take with you while you explore the region. 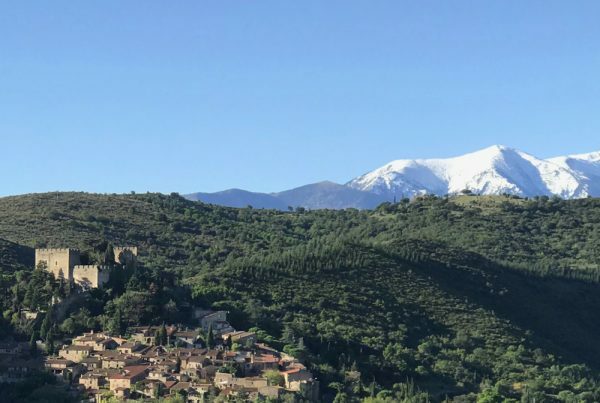 Castelnou is an official “Most Beautiful Village of France”. You'll find the medieval village about 6 kilometres from Thuir. 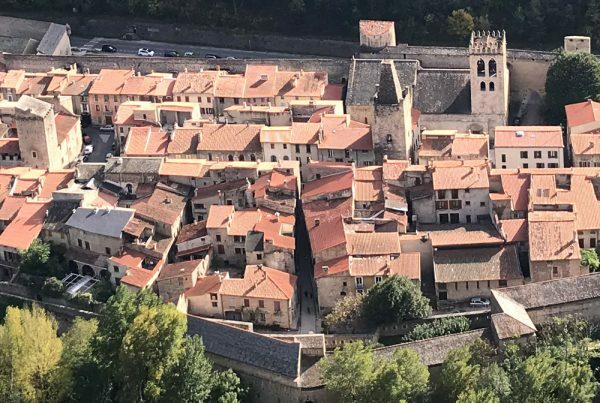 From June to October, there is a tourism office open in Castelnou itself. The tourism office in Thuir is open year round and can also provide you with information about Castelnou. 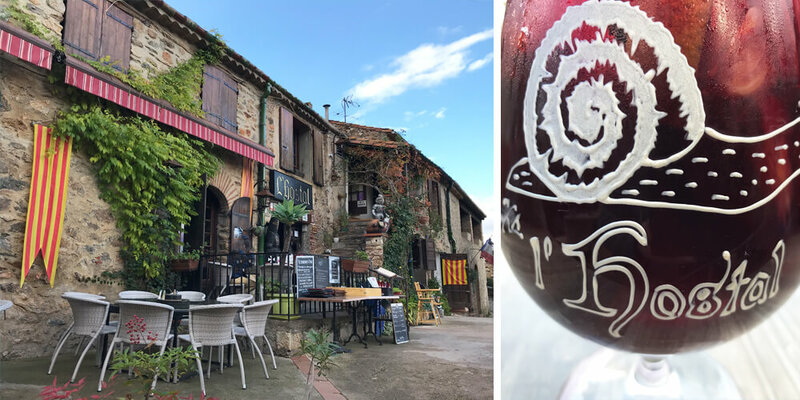 Like other “Beautiful Villages of France”, you will find a paid parking lot just outside of Castelnou, to which you will be automatically directed when following the P signs.